Two transition year students from St Paul’s Secondary School in Oughterard have been selected to represent their school in this year’s Bank of Ireland Junk Kouture regional finals in the TF Royal in Castlebar on March 7. Colm Fahy and Lauren Melia say they are “honoured” to represent not only their school but also their community next month. Their design is titled “Fuinneamh”, which is Irish for energy, and is based on the promotion of positive mental health. It demonstrates the different types of energy, such as physical and electrical, but also positive and negative as displayed by the contrasting shades of colour - both lighter and darker. The duo used 100 per cent recycled material to create their masterpiece and carefully crafted their outfit using 63 broken phone chargers, 220 strips of plastic coating and 250 lengths of wire. The two were inspired by Celtic designs - the spirals on the bodice and the necklace inspired by an ancient Celtic necklace called the Torc. The students decided to use old electrical accessories because technology is especially prevalent in today’s society and something the students say they are passionate about. They used phone chargers “to show that we can turn the negative energy into positive”. The symbolism present in this piece is inspirational and demonstrates how easily people can surround ourselves with positivity if they have the correct mindset. The competition, which is open to all secondary school students across the country, has been running for nine years and this is the first year any entry from St Paul’s has advanced to the regional finals, making it a huge achievement for Colm and Lauren. Their school is delighted for the pair and Colm Fahy and Lauren Melia say they were absolutely thrilled when they heard the good news. They have been working on this design since September and say they have put in “hundreds of hours” of work since then. It has always been Colm’s dream to enter this contest ever since he saw finalists on the Late Late Show when he was a young child. Even from a young age he loved to “fiddle around with a needle and thread” in order to create something new from something old. He says it has always been his passion “upcycling old clothes and giving them a new lease of life by turning them into new items such as cushions”. The two have decided to pair the outfit with the song “Electricity” by singer Dua Lipa as the model walks down the catwalk because they say it reflects the theme of the design perfectly as it is about positive and negative energy and electricity. Much like all the past winners and entrants, this design includes many fine details such as the plaits on the skirt and woven handbag. This is one of the many aspects of the design which helps it to stand out from the rest of the applicants. The deep message present in this creation will also help it to gain recognition as mental health is a topic that people seem to discuss incessantly nowadays. Last year’s Southern regional winner “Expressivo” is one such example of a meaningful entry. The design was carefully crafted using only the internal parts of a piano, as the students wanted to stress the idea that beauty comes from within. Judged by Irish celebrity Louis Walsh and actress Doireann Garrihy, the standard of entries has been increasing year after year as students are encouraged to focus on their passions and channel aspects of their own lives into their creations. As Louis Walsh stated, the judges look for ‘Who’s going to be different and who’s going to stand out”. I believe we can all safely say that this look would grab anyone’s attention. 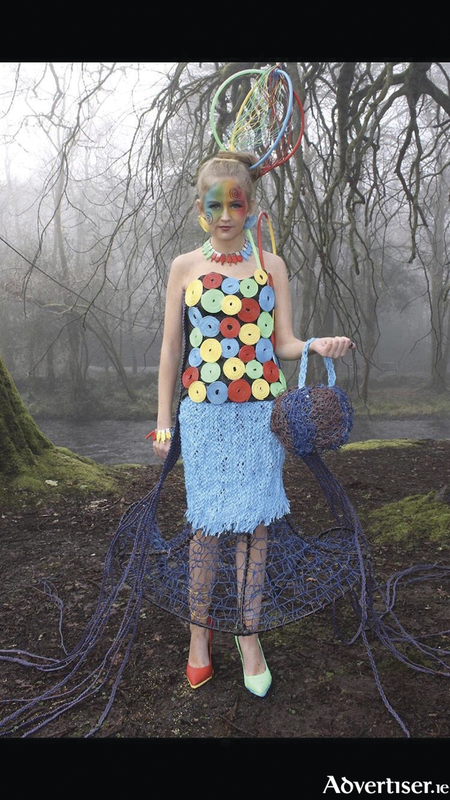 Under the guidance of their craft teacher Ms Thornton, Colm and Lauren have worked extremely hard to create a remarkable outfit which they say is a “statement for the modern age”. Through their design, the duo wish to encourage people to “Stop channelling the negativity and start charging the positivity”, which is definitely something we could all give a go at. Needless to say, these two students have produced some outstanding work and deserve all the recognition they receive. Voting ends Friday March 22 at midnight and counts for 10 per cent of the team’s overall score. It can be done on the Junk Kouture website, so do not forget to vote for Colm and Lauren. Page generated in 0.2063 seconds.